The market for legal cannabis in the United States is approaching $10 billion per year right now, and is projected to reach $25 billion by 2025, according to data from Statista. You could spend a lot of time contacting individual providers of CBD oil to see if they have affiliate marketing programs — and hope that they are high-quality CBD oil manufacturers. But there is a much easier way. RevOffers has aggregated the best CBD oil affiliate programs in the business. Earn 25% promoting premium pure oil CBD vape cartridges from Vape Bright. Earn 20% promoting quality naturals drops and topical products from Receptra. Earn 25% promoting Hawaiian hemp products from Mana Botanics. To be able to continually refine your online presentation like this, you need access to data. That’s why RevOffers gives you a robust set of analytic tools. It’s easy to track impressions, clicks, conversions and payouts. You get detailed reports on performance, referrals and conversions. Setting up any of this on your own would take specialized technical expertise and many hours of trial and error. 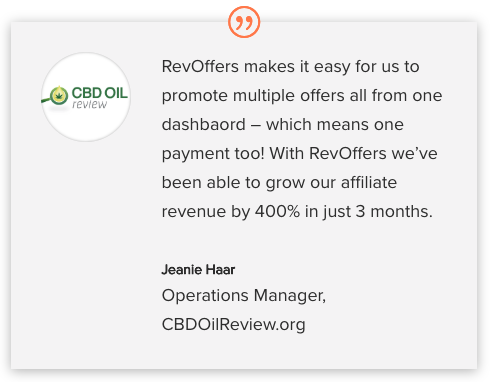 As a cannabis affiliate marketer, lack of time is your biggest constraint, so a comprehensive affiliate marketing program like RevOffers is your secret weapon. It accelerates your progress by giving you access to the best offers in the CBD oil business, and the data and analytics you need to continually improve your performance. Publishers work hard to deliver relevant content and drive quality traffic to their sites. Monetizing that traffic can be a challenge, and RevOffers simplifies the process by providing access to leading CBD oil companies who have unique products that consumers want. 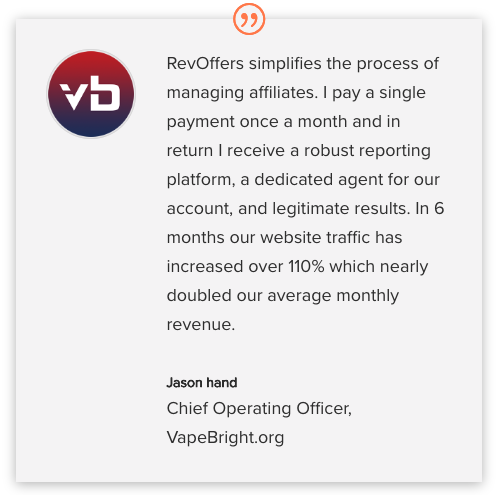 Add automated and reliable tracking, reporting and payout management, and RevOffers makes life a lot easier for cannabis marketing affiliates. Reliable tracking, reporting, and payout management. Curated selection of diverse, high-paying offers. RevOffers publishers are paid on-time, every time. How Does Cannabis Affiliate Marketing Work? To draw traffic to your site, you must provide relevant content that speaks to the particular audience you are trying to reach. For instance, if you are interested in vaping, you could provide your audience with information about how to vape CBD oil and medical cannabis, the benefits of vaping CBD, and the many options they have, between pen-style vaporizers, and tank-and-coil mods and various weed products that can be vaped. As you attract traffic to your site, you can expose your visitors to offers from CBD oil companies that have affiliate programs. When your audience members purchase products from the CBD oil companies you are working with, you earn commissions. Repeat and scale up. This is how you succeed as an affiliate marketer in the cannabis and CBD oil market. While making money through 420 affiliate marketing may seem easy and straightforward, the reality is that there are challenges. Once you have traffic then you must find the right CBD oil companies with amazing affiliate offers. This can be a hit or miss proposition. For one thing, many companies are rushing into the CBD oil business. The market is unregulated, and some companies, frankly, cut corners on the way to market. If you want to stay in business as a CBD oil affiliate marketer, you must engage with reputable companies. This means companies that use the right manufacturing processes to produce high-quality CBD oil and other medical marijuana products. Companies who are doing it right will be transparent — they will publish lab results showing the purity and potency of their products, so that your audience can have total confidence in the CBD oil that you are marketing on the company’s behalf. Want more ecommerce customers for your brand? Partner with RevOffers to craft an enticing performance offer; we’ll do the rest. RevOffers is a performance-based advertising network for transformational health products and brands.